So maybe TV is not dead. Has the success of BBC’s Sunday-night drama Bodyguard, with reportedly 10m viewers watching the final episode, proved the doubters wrong? I am not sure, but if nothing else, it has reminded us of the benefit of the simultaneous viewing and sharing of a piece of content. It becomes a topic of conversation, on the news channels, in the press, on radio, in social channels, over the garden fence and at school pick-up. How brand owners must relish a return to those days. 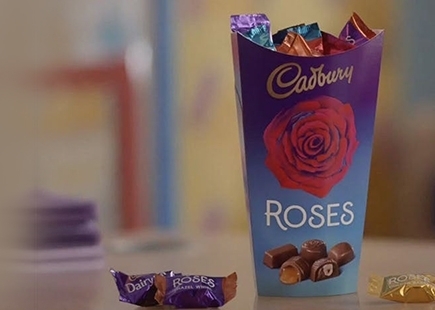 Perhaps the Cadbury’s marketing team not only foresaw the renaissance of television as a serious possibility, but also the opportunity to exploit some long-term, well-established brand assets by returning the brand to its strategic and creative heartland, and to the channel where these assets were created. 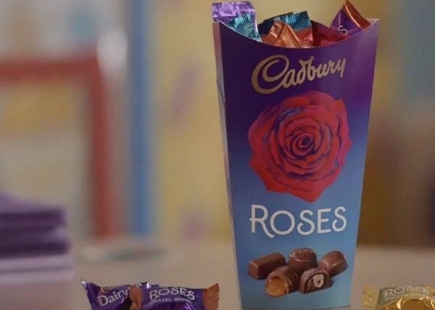 Cadbury’s Roses’ heritage as a family brand represents a legacy as long and extensive as any fmcg brand still with a shelf life. The agency team needed to find a way of exploiting that legacy that was recognisable (difficult, when you have been away for 20 years) and also brought the brand up to date, rather than expecting today’s consumers to enjoy being taken back into the past on the basis that, with the benefit of the prism of nostalgia, things were so much better then. So the idea, rather than simply evoking nostalgia, was to make the brand relevant to today by exploiting an eternal truth about human behaviour and interaction and one which also happens to be at the heart of the brand’s DNA. Generosity and gratitude make good bedfellows. Express this core truth though the eyes of a small boy and his Dad and you’ve probably got a winner. The TV commercial tells the story of a little boy picked up from school by his Dad who, much to his Dad’s increasing confusion, says ‘Roses’ to everyone he meets in gratitude and appreciation. ‘I’ve got no idea where he got that from’ says Dad to a waitress (who’s just given the small boy a soft drink) in a wonderfully self-deprecating tone so as not make himself look too much of a fool or simply out of touch with his child. We discover later that the small boy has overheard a conversation between his teachers trying to decide the best way to say thank you. Nearly £3m is being spent on television over the next seven weeks and I managed to find the concept has rolled out across Cadbury Ireland social pages (Facebook, Instagram and Twitter) supported by three lovely films where popular Irish TV presenter Dáithí Ó Sé and Cadbury say a big Roses thank you to people who do amazing work – hospices, charities and post offices – a highly appropriate extension into digital that I think will resonate with a new audience. However, at its emotional core is a common single-minded proposition based on the fact that it’s nice to say thank you, and that there is no better way of doing so than with a box of chocolates. Undeniably true and part of British custom and behaviour. This is a commercial in the great tradition of the best of British TV advertising, that is beautifully under-written and exquisitely performed as well as brilliantly directed and art directed by the VCCP and Riff Raff team. Even though it is sweet and tender it is not saccharine in any way whatsoever and has an edge to it that makes it totally believable, with a great relationship between the father and son to hold it all together. The great thing about an execution that is crafted with this degree of care and attention is that it connects. The viewer understands it, empathises with it and is probably reminded of why they liked Roses so much in the first place. This is a deeper interaction than mere engagement, the ultimate goal of today’s online moving content. Can it achieve the desired response through the television screen? Can a monologue still work? Call me old-fashioned, but I would say ‘yes’ to both of those. I am struggling to find any fault with this idea, execution and production. I did, as part of my efforts in assessing its likely impact and effectiveness, look back at the history of the ‘Thank you very much’ campaign, to better take a view as to whether this new execution was exploiting the brand’s assets to the full. Looking back at the 80s, The Scaffold were never my favourite band (even though, or maybe because, Paul McCartney’s brother was one of the duo) and their only significant vinyl success, ‘Thank you very much’, never found its way into my record collection. Its awfulness was compounded by some unremarkable lyric writing for the TV films along the lines of ‘Thank you very much for doing the dishes….Thank you very much for being my Missus.’ So, I thankfully concluded that these earlier executions had been consigned to the history bin, but that the brand’s position and core proposition had been retained and executed for today’s consumer. ‘Another way to say thank you’ sums up the storyline to perfection and reminds us why we should buy Roses.